I’ve often wondered why Glasgow hasn’t followed London’s suit in bringing decent street food to us city dwellers. There’s little doubt that this is an area in which the western world has trailed behind South-East Asia, India and North Africa to name a few, but London has witnessed a burgeoning trade in street food over the past decade as trailers and caravans rapidly pop up in markets across the city. Despite a particularly nasty bout of food poisoning contracted after sampling the street fare in Vientiane, Laos, I still think there’s no better way of immersing yourself in a culture when exploring new destinations. As I can tell you myself, there’s always an element of risk when chowing down as the locals do, but it has to be your best shot at authenticity. For now, Glasgow’s best effort at street food amounts to a late night burger van calculatedly positioned at Charing Cross to draw in inebriated, unthinking revellers heading west from the debauchery of Sauchiehall Street at 3am. I, for one, would be interested to learn the outcome of DNA analysis on those ever-popular patties. Fortunately, a collective movement for change is beginning to create some ripples in the dank, stagnated waters of Glasgow’s destitute street food scene. A growing number of forward-looking chefs want to bring real, high quality food to the crying-out-for-it streets of the city. However, dealing with the ever-exascerbating Glasgow City Council was never going to be easy and licensing applications have consistently been rejected. Read about why here if you want to get angry. 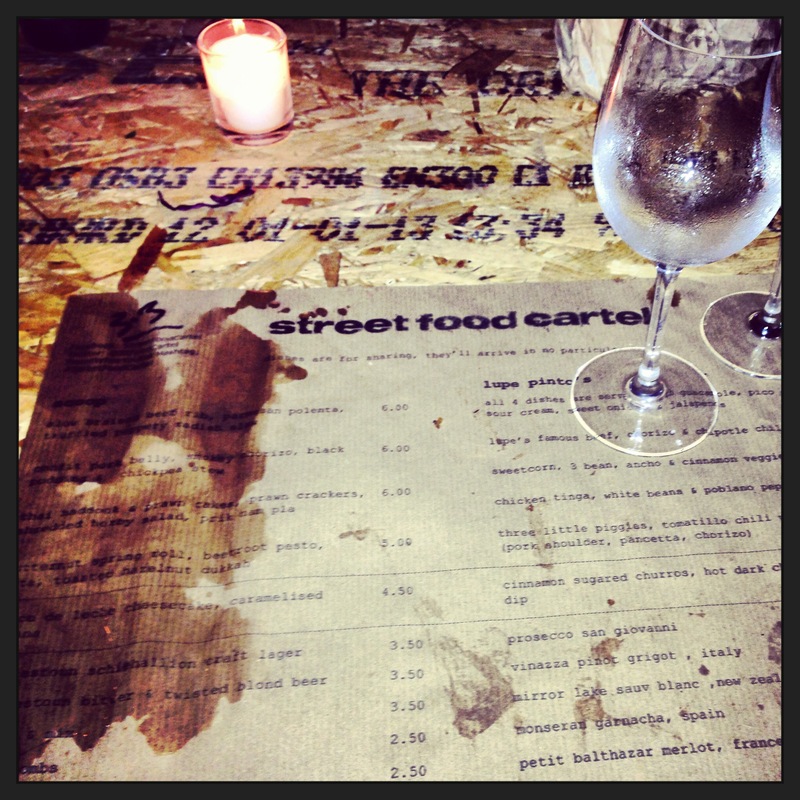 In a refusal to back down, Street Food Cartel was born. Put simply, it brings the street food experience indoors as a pop-up restaurant based at SWG3 in Yorkhill. This exhibition space and gig/club venue was the perfect choice for an edgy event like this because it’s already a popular haunt of the city’s moustache-toting, horn-rimmed spectacle-clad hipster community. News of the first event in March would spread like wildfire on social media, prompting extra dates to be added and leaving those who didn’t make it along really smarting. Yes, that includes me. When the next pop-up was announced, I hopped right on that bandwagon and snapped up tickets for Friday 10th May. Expectations were high. After navigating my way to SWG3 – my third or fourth visit but my first time sans pre-bev – I made my way into the former warehouse through a series of unmarked, un-handled doors, eventually emerging into a pretty large space crammed full of makeshift trestle tables and zealous diners. I was offered a complementary Schiehallion beer or a vodka cocktail on arrival and – being a girl – I opted for the latter. Presented in a glass bottle wrapped in a brown paper bag, it was truly Pinterest-friendly. Unnecessary? Probably. Pretentious? For sure, but I won’t pretend that it didn’t meld excellently with the guerilla-style, illegal warehouse party atmosphere going on. It was tart, refreshing and lovely and I would’ve really liked another, but it was a welcome drink only and didn’t appear on the menu. Unfortunately, I also have no idea what was in it aside from vodka, lots of citrus and lots of sugar, making it rather difficult to replicate at home. Sitting in a group of six – a couple of whom had attended the debut SFC in March – we opted for ‘one of everything, please’. Within just three or four minutes, our end of the table was overflowing with spicy, Mexican fare from Lupe Pinto’s Deli, the Great Western Road stalwart famous for its chillies, chorizo and hot, hot spices. All of it was delicious, coming with soft tacos and sides of guacamole, pico de gallo, jalapenos and sour cream. As a disciple of the mighty chilli pepper, I embraced this spicy offering as a scrumptious kick-start to the system. ‘It all starts to taste the same after a while’, I heard a couple of people in my party utter, but I disagreed. The beef, chorizo and chipotle chilli was brimming with richness and flavour and heat, while the sweetcorn, three bean, ancho and cinnamon veggie chilli was a much more piquant palate-cleanser. For me, however, the chicken tinga was the outright winner. I’m always really impressed when someone takes chicken from a fairly standard filler to a genuinely satisfying feed, and that’s exactly what Lupe Pinto’s did here. The poblano chillies offered it plenty of heat, but the white beans added a smooth, creamy texture that delivered a new layer to the usual formula of (Tex-)Mexican cuisine I’m used to. Teamed up with tender, well-seasoned chicken, the dish was very nice indeed. You’d think that would be enough, but there were still four dishes to come from scoop. At the forefront of the campaign for street food in Glasgow, scoop is operated from a silver, bullet-shaped caravan that wouldn’t look out of place in a 60s sci-fi movie. Chef Jonathan Macdonald founded the company after spending many years travelling the world and cooking as he went, including a five-year stint as head chef for the McLaren F1 team. A quick glance at the SFC menu tells you that scoop’s style is undoubtedly influenced by global flavours and ingredients. First out were the Thai haddock and prawn cakes which, I can tell you, looked like beautiful golden nuggets atop a crunchy, contrasting herb salad. I cannot, however, tell you how they tasted. Unfortunately, there just wasn’t enough to go around six people. As a lover of fishcakes, this would have been particularly devastating for me if there weren’t plenty of other dishes to distract me from my anguish. Blending Asian, North African and Mediterranean cuisine, the butternut squash spring roll, beetroot pesto, feta and toasted hazelnut dukkah marked a big in-your-face to those who slate vegetarian food. Flavour, texture and aroma: it had it all. The (insanely tender, gelatinous and melt-in-the-mouth) beef rib and the confit pork belly weren’t far short of divine, but this veggie combination was sensational. Not only that, but it was ‘clean’: it tasted like it was good for me; it offered a welcome lift from the full-bodied, excess of rich, meaty flavours I’d been gorging on all evening. The butternut squash spring roll was easily my favourite dish of the night and I only hope I’ll get to try it for a second time in future. After finishing off with some of Lupe Pinto’s churros – decent cinnamon pastries and beautiful, bowl-lick-worthy molten chocolate sauce – we were out of there, aware that the next round of eager eaters were waiting with much anticipation to get a hold of our end of the table. There’s no denying that the food was excellent and I’ll certainly be snapping up tickets for the next round, but I do hope that a few teething problems will be addressed. Firstly, it was near impossible to hold a conversation with anyone who wasn’t directly to your left or right because of the beats booming around the cavernous, exposed brick space housing the event. I really commend the addition of a DJ because it emphasised the uniqueness of SFC, setting it far aside from your average restaurant meal, but emerging from dinner hoarse isn’t ideal. I’m no sound engineer, but maybe just turning down the volume a little would resolve this issue I’ve heard quite a few grumbles about. Secondly, I was very keen to sample the Tapatio tequila con verdito, but our round never showed up. 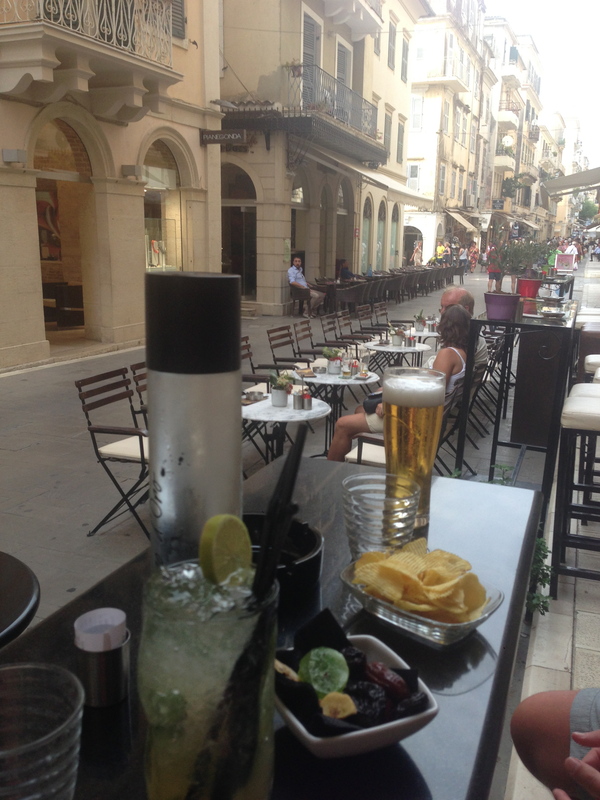 As we made our way out 30 minutes after ordering these and not having had a waitress in earshot during that time, I saw the barman pouring six tequilas which were probably bound for our willing necks. There had clearly been a bit of a breakdown in communication which could probably be resolved quite easily with the addition of some more waiting staff. Sorry I didn’t manage to capture even one tantalising dish for you: an unmistakable animal instinct took hold of our pack and the food was long extinct before I could even consider resting my jaw to grab my iPhone. 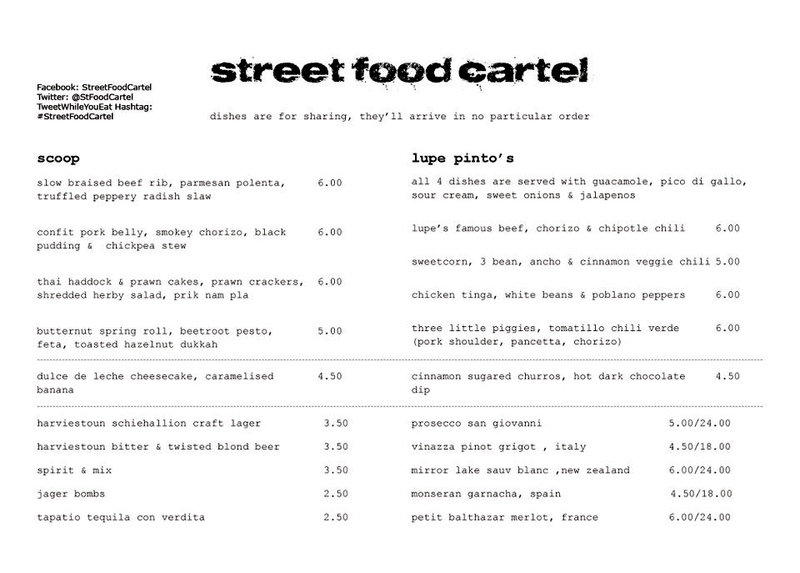 You can check it all out on the Street Food Cartel Facebook page here. Categories: Eating out | Tags: beer, butternut squash, chicken tinga, chilli, churros, cocktail, culture, food, Glasgow, Laos, London, Lupe Pinto's, McLaren F1, Mexican, Mexican cuisine, review, Schiehallion, scoop, Street food, Street Food Cartel, SWG3, tequila, travel, Vientiane, vodka, west end | Permalink.